William Seward Burroughs was born in Rochester, New York, on 28 January, 1857 (some sources state his year of birth as 1855, or even earlier) to Edmund Burroughs (1826-1892), a mechanic, and Ellen Julia (Whipple) Burroughs, a homemaker. Edmund was such a fervent admirer of William Henry Seward (1801-1872), the famous abolitionist and governor of New York, that he named his son after him. William had an elder brother, Charles E. (born 1852) and sister (Anna, born 1855, who became a music teacher), and a younger brother (James, born 1861, who became a printer, then ventured into the emerging automobile business). 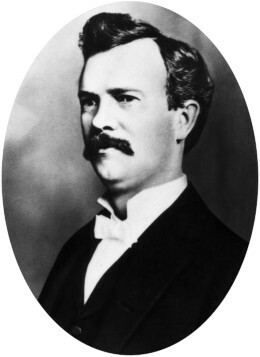 Edmund Burroughs was born in New York in 1826. He was the son of James C. Burroughs (7 Oct 1801–31 Oct 1865), who in the early 1840s moved west and bought a farm near Lowell, Michigan, made it prosperous, and later organized a national bank in Lowell. Edmund was a good mechanic and model-maker for castings and new inventions, and had a thorough knowledge of mechanics and some inventive talent (he even filed patents for a railroad jack and a paper guillotine). The family lived in Rochester, New York, where Edmund owned rather successful machine shop, until the late 1860, when they decided to move to live near Edmund's parents in Lowell, Michigan. The family remained there until October of 1871, when they moved to Auburn, New York. The years in Lowell would have great influence on William. His elder brother Charles recalled that "Willie" spent a great deal of his time tinkering in his father's machine workshop, located in a woodshed. He was a stubborn boy, showing an early talent for tool use and just like his father, he was always building something, giving also evidence of persistence and resistance against opposition. However, one thing Willie did not have was a talent for physical activities. His brother described him as hopelessly outdistanced in any boyhood activities requiring strength or endurance. 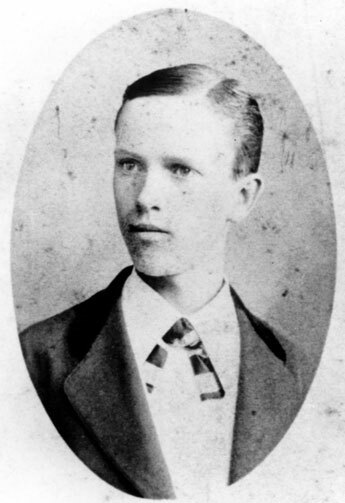 In the autumn of 1871 William entered the Auburn High School. In early 1872 he went to the old Genesee street No. 2 School in Auburn to listen to a lecture on Mathematical Short Cuts. During this talk he was fired with an idea that he can revolutionize clerical office practice throughout the world, creating an adding machine. Going to the lecture he merely expected some interesting tips that might help him with his arithmetic, but the train of thought created in the boy's mind by the speaker, led him through sickness, financial wreck and discouragement to the end of the rainbow to find success. After a half day of experimenting, William exclaimed: When I get to be a man I will make an adding machine that will amount to something in the world. In 1873 William left the high school, and went to work in Auburn post office and also as a planer in a lumber yard. From there he went to the Cayuga County National Bank, where he became discount clerk, but several years later he broke down from overwork. After a long and serious illness (he was already diagnosed with tuberculosis), William went into manufacturing on a small scale and lost all he had. Undaunted, he removed to Saint Louis, Missouri, in 1880, advised by his doctors to find a warmer climate and a more active occupation. William moved to Saint Louis together with his father Edmund and his wife Ida (they married previous year). In St. Louis Edmund and William Burroughs established a workshop. In Gould's Directory of St. Louis for 1881 there was a listing for "E. Burroughs and Son, model maker; steam gauge testing apparatus, models in wood and metal, forty years experience." Later William worked for the Future Great Manufacturing Company, and still later for Hall & Brown Co, in the manufacture of wood-working machinery. His experience with his father and these two companies, covering in all a period of some three years, constituted his entire training in practical mechanics. He had, however, a genius for theoretical mechanics, and his experience in his father’s shop brought him into contact with many inventors. At that time the desire to build an adding machine that he had expressed earlier would now become an obsession. Although the climate in St. Louis was good for his tuberculosis, it was bad for precise drawing. He found that the high humidity caused shrinkage and expansion in his drawings, and solved this problem by scratching his concepts onto metal plates. By late 1884, William would have a working model of his adding machine (see the adding machine of Burroughs) and filed an application for a patent in 1885. Along the way he would meet several businessmen, like Thomas Metcalfe, Richard Mitchell Scruggs, and especially Joseph Boyer, who would become key to the commercial success of his invention. On 30 July 1879, William Burroughs married in Groton, New York, to Ida E. Selover (born in 1859 in the village of Moravia, near Auburn, to Perry Hazard Selover (1825-1887) and Mary Ann Allen (1827-1888). The family will have four children: Jennie (born 1880), Mortimer Perry (1885–1965), Horace Seward (1886-1915), and Helen (born 1892). Mortimer (Mote) Perry became a businessman (he ran for some time an antique shop in Palm Beach), and his second son (see the upper family photo) was named in honor of his inventor grandfather. William Seward Burroughs II (1914-1997) went on to become a notable figure in American letters in the twentieth century as an avant-garde novelist. The second son of William Burroughs, Horace Seward, became addicted to drugs (morphine), and finished his life tragically only 29 years old, from self-inflicted wound (he cut his vein, crazed by the inability to obtain morphine). William Burroughs was the classic absentminded inventor—his wife had to remind him to change his clothes and to eat, and used to say she had five children: two boys, two girls, and a husband. He was remote and cold to his children and didn't allow them to bother him when he was working. He drank alcohol "to keep his energy up", and once became so furious with manufacturing problems with his machines, that he threw open the window and tossed out all machines to smash to pieces on the ground. In early 1890s Burroughs' business really took off, but his (and his wife's) health had continued to worsen. In early 1896 he resigned from the company and moved with Ida to hot-springs spa of Citronelle, Alabama, hoping that the change in climate would help him to get over his tuberculosis. However, Ida died there on 7 May 1896, and less than a month later Burroughs remarried to his children's nurse Nina F. Keltner (b. 1865). But he didn't long survive his wife, and died in Citronelle, on 14 September 1898, only 41 years old, and was interred in Bellefontaine Cemetery in St. Louis, Missouri. His widow, Nina, was appointed guardian of the children and executor of his quite a big estate.